It is with heavy hearts that we say goodbye to our beautiful mother, grandmother and great-grandmother Elvena Mary Hewlin aged 92 years. She cared for all of us with the greatest passion one could have for her children from our births to her death. 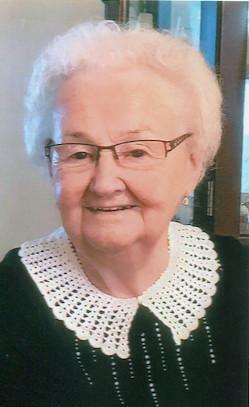 She passed away on January 14th, 2019 at the Sir Thomas Roddick Hospital in Stephenville lovingly surrounded by her family. Left to mourn her passing are her children Verbon (Jean) Hewlin, Iris (Larry) LaVallee, Velda (Ronnie) McIsaac and Glen (Marilyn) Hewlin. Grandchildren- Christopher, Heather, Susan, Penny, Justin, Ian, Ashley and Cody. Great-Grandchildren- Hailey, Kobi, Luca, Miquel, Wesley, Samuel, Abigail, Elyse, Hudson and Meyer. Also left to mourn are her siblings; brother Jerry (Mary) Hulan, sisters Vivian Brake, Ruby Gillam, Pearl Hulan, Una (Don) Gillam, sister-in-law Roma Hulan and many other family members and friends. Elvena was predeceased by her husband of 53 years Harvey Hewlin in 2000, her parents Ellen Jane and Jeremiah Hulan and by her brothers Ellis, James Rodney and George. In keeping with Elvena’s wishes, cremation has taken place. Visitation will take place on Wednesday January 16th, 2019 from 2-4 and 7-9 pm at Russell’s Funeral Home 57 Prince Rupert Drive in Stephenville. Funeral Services will take place on Thursday January 17th, 2019 at 2 pm from St. Augustine’s Anglican Church on Hillview Avenue in Stephenville with Rev. Kris Gosse presiding with inurnment to follow in the Hillside Interfaith Cemetery on the Hansen Highway. As expressions of sympathy, in lieu of flowers donations may be made to the Sir Thomas Roddick Foundation or a charity of one’s choice.